.22 Plinkster runs of the most popular gun-centric YouTube channels. His videos have been watched by hundreds of thousands of firearms fans. Many of .22 Plinkster’s videos involve trick shots, such as shooting a .22LR through 100 balloons, but he also does serious reviews. He’s actually a very competent marksman who has shot a vast collection of .22 LR/22 WMR pistols and rifles, making him a qualified rimfire expert (as well as a trick-shot artist and showman). The Savage A22 is the .22 WMR “big brother” to Savage’s popular A17 17 HMR rifle. In this video, .22 Plinkster demonstrates that the A22 is a very reliable semi-auto that can deliver near-1 MOA accuracy when the barrel is clean. This rifle retails for about $390.00. The S&W Model 41 is a classic American rimfire target pistol. Beautifully crafted, the Model 41 boasts a superb trigger, comfortable grip, and excellent accuracy. New or used, a Model 41 would be a fine addition to any firearms collection. The Scorpion demonstrated exceptional accuracy in the hands of .22 Plinkster. It comes with a large target-style grip. With a built-in compensator, the Scorpion stays on target with almost no muzzle rise. The comp can be easily switched out with a suppressor (See video at 3:00 time-mark). 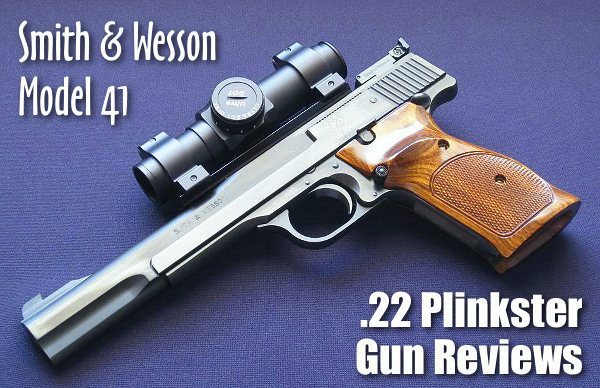 .22 Plinkster liked both pistols. He favored the grips on the Ruger while preferring the S&W’s trigger. He felt the Ruger’s iron sights were best for precision work, but he noted that the green dot fiber optic sights on the S&W Victory worked better for speed work. Share the post "Rimfire Round-Up — Five Rimfire Guns Reviewed"
The CMP and NRA now allow magnified optics (up to 4.5X max power) in service rifle matches. You can spend thousands on a high-end scope for your AR, but you just might find that a much cheaper optic will do the job. 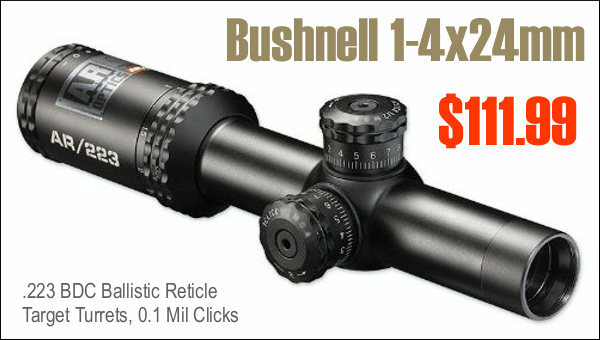 Right now Amazon has a killer deal on Bushnell’s 1-4x24mm riflescope with 0.1 Mil clicks. The Drop-Zone BDC reticle features hold-over points calibrated for .223/5.56 55-62 grain ammo. That’s a bonus for 3-Gun and tactical matches. When shooting heavier, higher-BC bullets in service rifle matches, you’ll still want to click up and zero at your target yardages. Second Focal Plane, Drop Zone-223 BDC Ballistic Reticle calibrated for 55-62 grain, 223 REM/5.556 loads with aiming points out to 500 yards. “The scope is solid and the fit and finish is excellent. The BDC reticle is very clear and the scope stays focused when changing the magnification. The glass is very clear and the light transmission is better than my Vortex Viper. The windage and elevation turrets are precise and not mushy. At a local gun store I compared this scope to a much higher-priced M223 Nikon and a Leupold. The clarity was similar and the light transmission was actually better in this [Bushnell] scope. The only noticeable advantage the higher-priced scopes had was they weighed less. The best eye relief for my setup was four inches without any noticeable parallax.” — Dave K.
Share the post "Killer Deal on 1-4x24mm Bushnell Scope for ARs"